A person with a bunion actually has an enlarged or misaligned joint. The joint that is most often affected is the one that connects the big toe to the bones of the foot; the metatarsophalangeal joint. In some cases, a similar problem can occur on the pinky or smallest toe. If that is the case, it is usually referred to as a “bunionette” or a “Tailors Bunion”. The affected bone is called the fifth metatarsal. Medical terms used to describe the conditions include hallux valgus and hallux abducto valgus. Hallux is Latin for “great toe”. Valgus and abducto refer to the inward leaning angle of the toe. In both cases, you will see start to see a protrusion. Doctors can typically make the diagnosis simply by examining the foot, although they may order X-rays to determine the extent of the damage. In the case of a bunion below the big toe, the toe starts to lean towards and press against the second toe. This can cause rubbing, blistering and irritation on that toe. Pain in the joint is a common symptom. Redness occurs as the protrusion presses or rubs on the inside of the shoe. In a Tailor’s bunion there is redness, inflammation and swelling. In both cases, the skin becomes irritated and can blister after long walks. In a word, “pressure” causes them. Although there may be a genetic tendency towards developing the malformations, ill-fitting shoes that place undue pressure on the joints play a major role in their development. Wearing shoes that are too narrow or choosing styles with pointed toes will eventually cause the problem. Many women’s styles are simply bad designs. They might look good, but the feet are not shaped that way. The term “Tailor’s Bunion” came about because tailors typically sat cross-legged, which put the pressure on the fifth metatarsal or the bone of the pinky toe. Narrow, pointy shoes are the most common cause, today. The first step is to stop wearing shoes that apply pressure. Soft, giving materials are a better choice than hard leather. If dress shoes must be worn, a shoe stretcher is the next step. Cedar shoe stretchers are available with attachments that provide additional room in the location of the bunion. The third step depends on the severity of the condition. Bunion pads are not a good choice, as they put additional pressure on the area and do not resolve the problem. If the condition is minor, a “Toe Spreader” made of silicone gel will help prevent the condition from worsening. 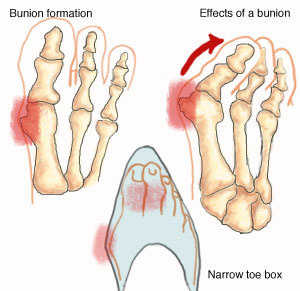 In more advanced cases, a “Bunion Regulator” or “Bunion Brace” may be used to realign the big toe and joint. In the worst cases, surgical correction is necessary, which requires time off of your feet. Obviously, the best way to prevent bunions is to always wear shoes that are wide enough for your feet. If you forego styles with point toes today, you’ll be more comfortable in the future.